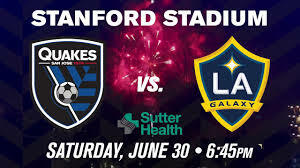 With the big game just around the corner, I wanted to give you some information regarding Saturday’s Quakes game. Kickoff is at 6:45 p.m., but fun will certainly start hours before! I am attaching a link to Game Day FAQs for your reference. Note the CLEAR BAG POLICY in effect and that parking will be $30-$40 per vehicle – CA$H ONLY. 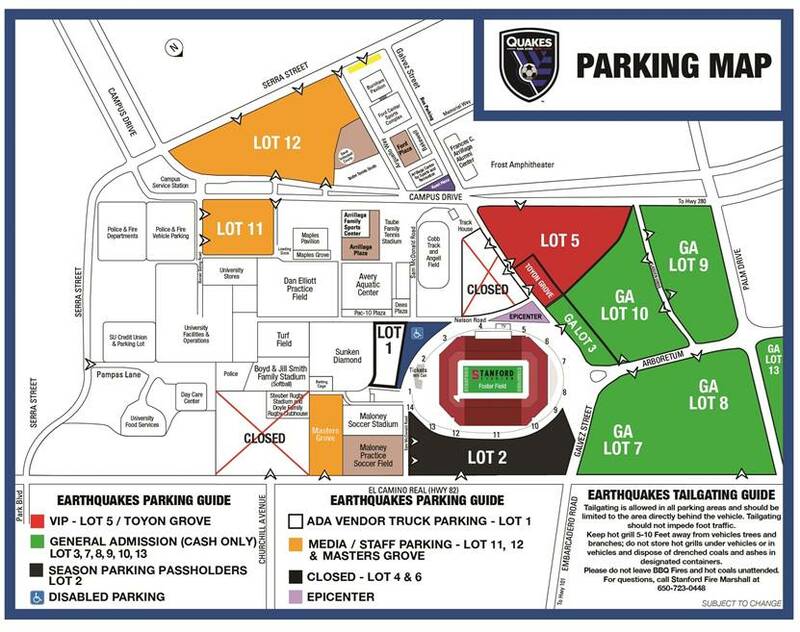 In regard to the Potluck Tailgating Gathering, we will be setting up in Parking 8 (GA Lot 8) shortly after 3:00 p.m. To access Lot 8 from Northbound El Camino, turn Left onto Galvez Street. To access this lot from Southbound El Camino, turn Right onto Palm Drive, Left on Campus Drive and then Left on Lasuen Drive (One Way only). It is best to get a nice big area along the outer right edge of Lot 8 so that folks can easily leave the parking lot after the game. We plan to arrive ahead of the group and be in the parking lot by 3:00 pm to set-up and reserve spaces. If you want to join our caravan into Stanford’s parking lot, please be at the Menlo Park Safeway (at 325 Sharon Park Drive, off of Sand Hill Road) no later than 2:30 p.m. to join us. You are welcome to join us early or arrive any time after. Note, however, that the later you arrive the harder it will be for you to join the tailgate as parking lots closest to the stadium fill up fast. If you will be joining us, please let me know & we will try to save you a spot, if possible! Call me when you are near & I will let you know where we have set-up. We will be bringing a couple of grills, (and all the grilling utensils and necessities), & a couple of tables. We will also bring 50 hamburgers & 50/hot dogs. We would ask that you bring your own additional grilling meats, a salad or other side dish to share, and a dessert to share (brownies, cookies, and/or fruit are always favorites). A gentle reminder to please remember to bring your sports chairs, tables, coolers, grills, etc. This should be an exciting event for us all! We look forward to making lasting memories with each one of you! Go Quakes!